“Prei Schotel” is the Dutch name for a layered oven dish with leek (“Prei”). 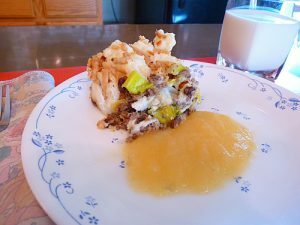 It is similar to shepherd’s pie but with fewer ingredients. Peel, cut and boil potatoes until done; mash to remove lumps. While potatoes are cooking slice leeks in half the long way. Remove and discard the root end to about 1/4 of the total length (keep about ¾ of the rest). Cut the leeks into ½” slices. Set aside. Brown ground ground beef with salt and pepper, cook until half done, add raisins. Continue to brown until about ¾ done then add leeks. Cook for about 3 more minutes. Layer into the bottom of a 9” round or about 7” square baking dish. Cover with mashed potatoes. Top with French-fried onions or breadcrumbs. Bake for 20 minutes. Serve with applesauce on the plate or on the side.